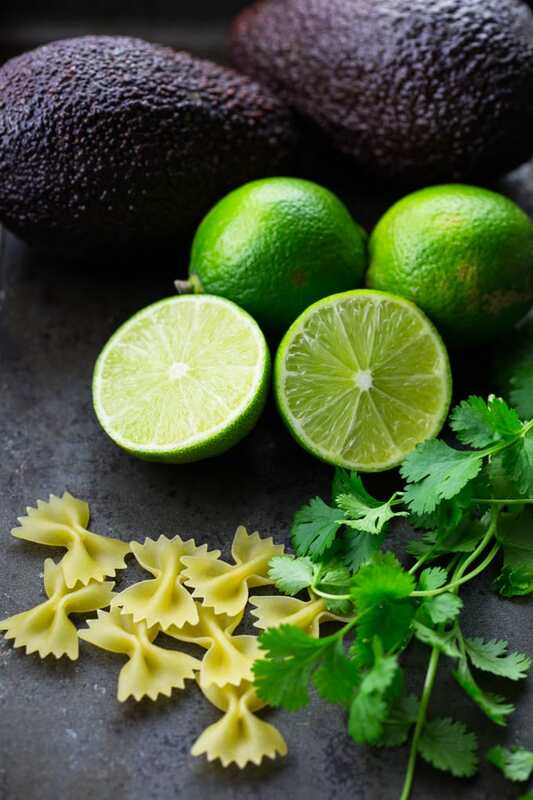 This Southwestern pasta salad with avocado, black beans, and lime dressing is one of my new favorites. It’s not only super easy to make, but also healthy. It’s a great addition to any BBQs and potlucks! If you’ve been reading my blog for a while, you probably know that I’m a HUGE pasta fan. I absolutely can’t get enough of pasta and there are just sooo many delicious vegan pasta recipes. Now that it’s finally getting warm outside, I just had to try some new vegan pasta salads. This Southwestern pasta salad was my favorite! I usually make an easy vegan pasta salad with Italian dressing, sun-dried tomatoes, olives, and artichokes. This is the usual pasta salad I bring to BBQs and birthday parties. Sometimes I also make a vegan pasta salad with pesto or my California pasta salad. But it’s so nice to try something new once in a while. And I’ll definitely make this vegan Southwestern pasta salad more often now. It’s just SO simple and yummy! The ingredient list for this pasta salad is not too long. You can find all of the ingredients in any regular grocery store. As always, you can find a printable version of the recipe in a separate recipe box at the end of this post. I used farfalle, but you can actually use almost any kind of pasta you want. It also works great with fusilli. If you don’t like cilantro, you could also sub it with parsley or just leave it out. Maybe add one or two additional green onions if you leave out the cilantro. For the dressing, I used fresh lime juice, olive oil, cumin, paprika powder, white wine vinegar, a little splash of agave, garlic, and of course salt and pepper. I think the salad tastes best when you let it sit in the fridge for a couple of hours. What’s you favorite vegan pasta salad? Do you prefer creamy vegan pasta salads with mayonnaise or Mediterranean or Mexican salads? I hope you like this vegan Southwestern pasta salad as much as we do around here. Let me know if you give it a try. If you’re looking for more vegan pasta salads, also check out my Greek pasta salad or my California pasta salad. Or have a look at my roundup of 15 amazing vegan pasta salad recipes for even more pasta salad ideas! Have a great start into the new week, everyone! This Southwestern Pasta salad with avocado, black beans, and lime dressing is one of my new favorites. It's not only super easy to make, but also healthy. It's a great addition to any BBQs and potlucks! Cook the pasta according to the instructions on the package. Once cooked, rinse with cold water and set aside. In a large bowl, combine all ingredients for the dressing. Add the ingredients for the pasta salad and stir well. Let the salad sit in the fridge for a couple of hours. Enjoy! I’d love to bring this to a cookout! It looks like a great side but also a good main dish. This is totally my kind of dish right here! Love the TexMex flavors and how easy this is to put together. Perfect for all those summer BBQs! I love all pasta salads! Southwest twists are delicious too. This looks really tasty! What a beautiful and colorful salad. The dressing sounds like it might be my new favorite. Looking forward to making it. This salad is perfect for Summer BBQs!! Love all the flavors and colors! Lively colors, and FAR better than those mayo-doused pasta salads often at potlucks and BBQs! Pasta salads are a favorite of ours once the weather heats up! This one looks delicious and so colorful! Pinning! What a lovely dish for a potluck … and I just happen to be heading to one tomorrow. This looks delicious! Im going to make this for our 4th of July cook out. I think I’ll add black olives to my salad. Thanks for sharing! Made it.. super easy and delicious! Great Pasta salad recipe, really delicious and the way it looks in the picture YUMYYYY :) Thank you for sharing this vegan salad with us. Made this last night and it was a hit! Super easy and delicious! I made a little bit extra dressing and the only thing I did differently was add a little bit of chili garlic sauce for some spice. Definitely a winner! Do you have any recommendations for sides with this dish that are vegan? Very delicious and simple. The hole family loved it. There are many pastas we buy that have zero eggs in them! Can I use this like in meal prep? Will it keep for 5 days in the fridge…. Loving all the fresh ingredients in the pasta salad! And that dressing sounds sooo delicious. ???? I tried this pasta salad today and it came out so great. Everyone at our barbecue loved it. Thank you so much. This was perfect! Great for vegans or non-vegans. We followed the recipe except for the agave bit in the dressing– we loved the tanginess without it. Some of us added hot sauce to it– excellent. Thank you! I just made this today for a family gathering. I can’t wait to taste it. Thank you. I love bow-tie pasta. It gives that extra pasta punch with the thickness, and I’m all about extra pasta punch. We had burritos yesterday, so we have all the ingredients on hand for today! I made this today.. It is fabulous! I tripled the dressing recipe though.